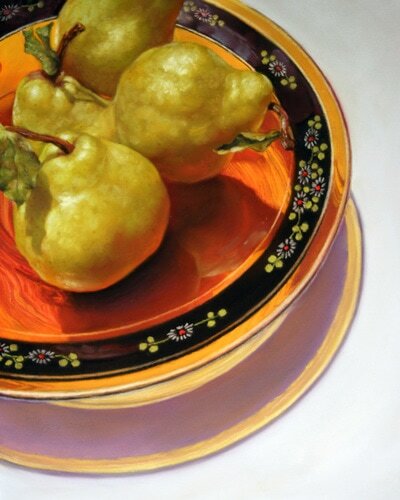 Lisa Ober is a portrait and still life painter, workshop teacher, and owner of OA Gallery in St. Louis, MO. Ober's work has appeared in publications including The Pastel Journal and Southwest Art. She has enjoyed numerous awards in the Pastel 100, an international pastel competition sponsored by The Pastel Journal. Ober also received a top award in the prestigious 2015 PastelWorld, a competition and exhibit held at the IAPS Eleventh Biennial Convention. Collectors have recognized her work for its clever content, exquisite realism, and detail. 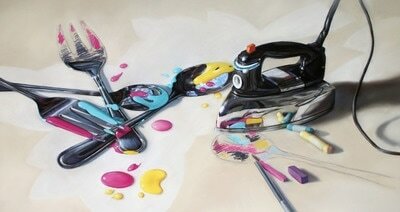 Ober enjoys making pastels "behave" the way she envisions as she endeavors to use the medium in fresh new ways. 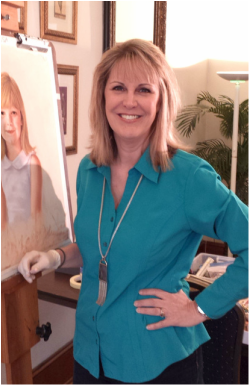 She is a signature member of the Pastel Society of America and IAPS Master’s Circle member. PSST: Your work is complex and precise. Without giving away workshop secrets, would you briefly describe the way in which you create artwork? LISA: I have a fantastic method approach to painting that I have developed over the last 25 years and I use it in my own work. It’s a 6 step process that works regardless of the subject matter I choose. What’s great about it is that when I teach I am not only teaching a particular subject but more importantly teaching a method that students can then incorporate into their own work! It’s a lot like the story teaching that if you give a man a fish he eats for a day, but if you teach a man to fish he eats for a lifetime. Sure, there are lots of tips and tricks that apply to various subjects (the extra nuggets of fun in workshops), but the goal of teaching for me is to give students an outline, a plan to make approaching painting easier and organized, and the freedom to paint without me! PSST: Our members paint in spaces that vary from a corner to a dedicated studio, so this is our favorite question: What is your painting setup? LISA: I work in a lower level studio (also known as a basement - haha). The good thing is I am in a section with windows and we do have higher ceilings than many basements. I work either at a drafting table or an easel and have a spectacular rolling table that’s 4 feet long on which I place my pastels. I can then roll it between the easel and table as needed. PSST: Marketing is a big issue for artists. What do you consider the most important marketing tool we should learn? Do you have any tips you would like to share on marketing, exhibiting, or social media? High quality business cards - I suggest business cards with images of your artwork on them. I love moo.com. The quality is tremendous and you can have multiple images for no extra fee! You can also print your own on Avery business cards. The glossy cards with rounded edges are very nice. Website - Every artist should have a well designed website as an online portfolio. Include your best work photographed professionally, newsletter sign-up forms, phone number (easily located), social media links, and information about you, the artist. I use Weebly to make my own website. It’s very easy to use and I am not dependent on someone else to update it. Networking - Often neglected by artists, meeting local artists, business people, and retailers whose products you use can lead to unexpected rewards. Call an artist you don’t yet know and invite them for coffee! Get out of the studio and see how wonderful and generous artists can be. Social media - Having a business Facebook page (not just personal) has been superb for me. Grow your “likes” organically and regularly post images and meaningful content. Treat Facebook like a community by engaging people who take the time to comment and interact with you. My advice is to avoid anything political as you automatically offend half of the country. Oh, and rarely pay for advertising. Newsletter - Keep in touch with people who appreciate your artwork. Continually build a list of names and emails for this purpose. Make sure you have permission to send a newsletter. Art organizations - Participate in medium specific organizations such as IAPS (and its accompanying local pastel groups), Pastel Society of America, as well as local art guilds/organizations, and get involved with volunteering as well as entering shows. Shows/Exhibits - While I do not do art fairs, I have seen many artists succeed by regularly attending fairs. Collectors can then rely on seeing these artists year after year and plan their purchases. My preference is to enter shows and exhibits. Perhaps you will be juried in or even win an award. What better marketing is that? Galleries - Galleries are a good option for marketing art to your local town, city, or region, but they aren’t the only way artists can be successful. With the digital connectedness we now enjoy, there are lots of options to market and sell artwork. My point is, don’t be discouraged if your work isn’t accepted by an established retail gallery. Consider starting with a gallery associate with an art organization or a cooperative. These kinds of exhibit opportunities give artists practice in talking about their work, interaction with other artists which often breeds great ideas, and inspires artists to create a body of work so they are ready for bigger and better things! PSST: You are the judge of awards for the PSST Art of the Pastel 2017 exhibition. What will you be looking for? LISA: Regardless of a particular style of painting, I always look for composition, mastery of the medium, technique, use of color and value, mood or message, and presentation. I am so excited to see the entries and honored to be the judge of awards for this exhibit! PSST: Tell us what events or workshops you have coming up. March 24-26 Marketing My Art, a workshop in St. Louis, MO. I will be speaking about preparing for the art business. I am one of the coordinators of this exciting workshop geared toward innovative marketing and sales strategies for artists. May 6-7 Grapevine, TX - Realistic Pastel Pet Portrait workshop. 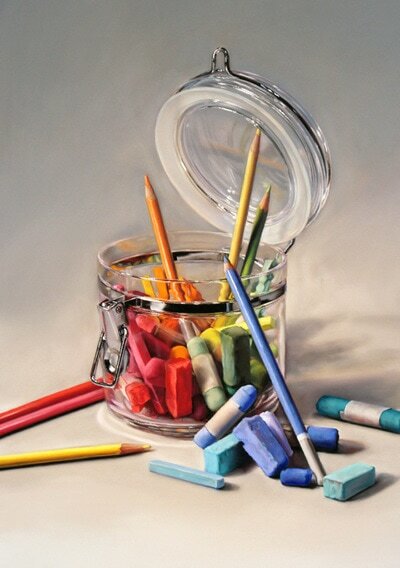 May 9-10 Gravette, AR - Realistic Pastel Still Life workshop. 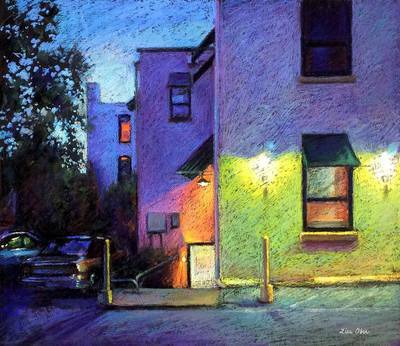 June 6-11 Albuquerque, NM - Demo artist for UART Sanded Pastel Paper at the IAPS Convention. Come say hello! June 23-25 Woodstock, VA - Realistic Pastel Pet Portrait workshop. 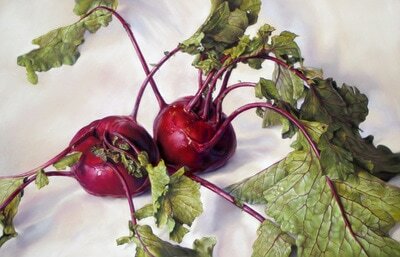 August 5-10 Corbeil, Ontario, Canada - Three workshops in pastel (still life, pets, and people).